First-quarter earnings are expected to suffer the biggest decline in more than five years, but financial company earnings are forecast to rise. 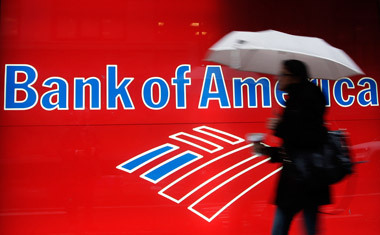 Bank of America is expected to drive much of the forcasted earnings increase in financials. The first-quarter earnings season starts in earnest on Wednesday when Alcoa reports after the market close, and the outlook is not pretty. S&P 500 earnings are expected to fall somewhere between 3% and 4.5% — the first year-over-year decline since the third quarter of 2012 and the biggest drop since third quarter 2009. The energy sector is seen as the single biggest driver of the earnings decline, with earnings per share falling 60% or more as revenues drop more than 30%. Revenues for the S&P 500 overall are expected to fall somewhere between 1.2% and 4.5%, according to a range of estimates from S&P, FactSet and Zacks. “This year will be a challenging year and we’ll be lucky to get mid-single [digit] earnings growth in earnings and prices,” says Sam Stovall, U.S. equity strategist at S&P IQ. But the outlook for financial companies is not so grim. First-quarter earnings for the financial sector could increase in the low double digits. Standard & Poor’s has financials leading all other major market sectors, gaining 10.9% in first quarter EPS. FactSet has financials as the runner-up, trailing only health care but still up 8.3%, and Zacks falls between the two with financials’ earnings up 9.5%. Bank of America (BAC) earnings are the biggest factor. The country’s second largest bank is expected to return to profitability in the first quarter, with earnings near 30 cents a share, compared with a five-cent decline a year ago, according to FactSet. Excluding Bank of America, FactSet says, financial sector earnings will rise just 0.9% in the first quarter. Bank earnings season starts on Tuesday, April 14 when JPMorgan Chase & Co. (JPM) and Wells Fargo (WFC) report before the market opens. Underpinning even the slim increase for financials are expected increases in revenues from trading, especially in fixed income, currencies and commodities (FICC), and a drop in regulatory fines. (Bank of America reported a net loss of $276 million in Q1 2014 because of billions paid to settle lawsuits involving mortgage-backed securities.) Loan growth is expected to improve but only moderately, led by commercial loans. On the negative side for financials are a continued squeeze on net interest margins – the difference between the interest rates bank charge for loans and the amount they pay on deposits — because banks can only charge so much when interest rates are so low. Margins could improve as interest rates rise but “only if the increase in long-term rates is higher than the increase in short-term ones,” according to a recent report by Zacks analyst Kalyan Nandy. And it’s not clear that will happen. The yield curve could even flatten, which would not help bank margins. “It’s a tough environment fundamentally,” says Anton Schutz, portfolio manager of the Burnham Financial Services Fund (BURKX) and Burnham Financial Long/Short Fund (BURFX). “The yield curve creates a lot of challenges. Loan growth continues to be lumpy and challenging and the economy continues to limp along.” He says regional banks especially will be affected by the tough winter. “There were a lot of days that people couldn’t even get to work…You’ll see some real anomalies.” Banks with large loans to the energy sector could also be hurt, says Schutz. One bright spot for the financial sector is wealth management, which has been growing because of positive demographics as more people save for retirement and gains in financial markets, says Stemm. But if markets pull back, she expects there will be pressure on those bank units. So which financial companies are expected to best in the upcoming earnings season? Among money center banks, Citigroup (C) seems to be a favorite. It has finally passed the government’s bank stress test after previous failures, which sets the stage for increasing its dividend; cut expenses; and entered into a co-branding credit card with Costco (COST). And, despite all that its stock is still trading cheap, below 10 times forward earnings.